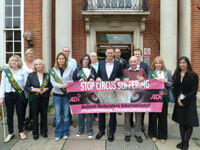 Matthew Offord, Conservative MP for Hendon, today made a stand outside the Hendon Library for wild animals currently languishing in UK circuses by backing the campaign of London based Animal Defenders International (ADI), who is seeking an outright ban on their use in circuses. Mr Offord met with ADI representatives and supporters and pledged to continue to put pressure on the Government to make the ban a reality. ADI congratulated him for continuing to speak out on behalf of wild animals in circuses, and will continue to work with him on this important animal welfare issue. Matthew said: “I am fully behind ADI’s campaign to ban wild animals in circuses, and applaud the hard work they have done to make progress on this issue over the years. ”Britain is a nation of animal lovers, however while some of our other European neighbours like Austria, Portugal and Denmark have already taken steps to ban wild animals in circuses, our own Government is falling behind. Jan Creamer, ADI’s Chief Executive said: “We are extremely grateful to Mr Offord for his support, and for speaking out on behalf of the animals who suffer day in and day out in travelling circuses. “Our undercover exposes of the circus industry in the UK and around the world have shown that confinement, deprivation and abuse are endemic to the circus industry. For instance, the shocking abuse endured by Anne the elephant at the winter quarters of the Bobby Roberts Super Circus earlier this year brought the circus industry to its knees and demonstrated perfectly why an outright ban is long overdue. Mr Offord played a key role in the Commons Debate in June, criticising the Government’s false claims of ‘legal difficulties’ in taking action to protect circus animals. The Government has since stated that despite this overwhelming show of support for a ban, it plans to proceed with a licensing system instead. The Defra Minister Caroline Spelman has claimed that banning wild animals in circuses would be illegal under EU law and may also be in breach of the Human Rights Act. However, ADI has published expert legal opinion from independent parties that categorically states that there are no legal obstacles to proceed with a ban. In 2010, a public consultation by Defra (Department of Enviroment, Food and Rural Affairs) resulted in a huge 94.5% public support for a ban on the use of wild animals in circuses. National measures to prohibit or limit the use of animals in circuses have already been adopted in Bolivia, Austria, Belgium, Czech Republic, Denmark, Estonia, Finland, Hungary, Luxembourg, Peru, Poland, Portugal, Slovakia, Sweden, Singapore, Costa Rica, India. Mexico and Israel and similar laws are being discussed in Brazil, Colombia, Chile, and Greece. All of these countries have looked at the evidence and listened to the will of the people and done the right thing by implementing bans. It is high time that the UK government did the same. Photographs and footage is available. Interview opportunities are available on request. Photo caption: Left to right: ADI Supporters Vania Lawrence, Patricia Willey, Valerie Lawrence, Fay Jenkinson, Craig Willey, Kerry Folan, Deborah Willey, Matthew Offord MP, Rob Jenkins, Peter Wise, Steve McGuinness, Tracey Gascoyne, Alexandra Cardenas, ADI. In June this year, a backbench debate saw over 50 MPs from all of the major parties vote unanimously for a motion tabled by Mark Pritchard MP, calling for an outright ban on the use of wild animals in circuses under the Section 12 of the Animal Welfare Act 2006. Though not legally binding, Parliament is generally understood to have to respect the will of the house. They analysed if a ban could potentially affect a person’s right to respect for private and family life under the UK’s Human Rights Act (HRA) (article 8) and the protection for property (article 1 of protocol 1 HRA). The advice concluded that a ban would be within the ‘margin of appreciation’ afforded to the UK. ADI’s exposé of the horrific abuse of elephants at the Great British Circus in 2009 put wild animals in circuses back on the political agenda, and their evidence was presented to Government which helped prompt a public consultation on animal circuses in December 2009. The distressing evidence can be found at the following link: http://www.ad-international.org/animals_in_entertainment/go.php?id=1887&ssi=10. Between 1996 and 1998, ADI field officers worked undercover inside three circus establishments run by different members of the Chipperfield family: Chipperields’ circus as it toured with animals owned by Dicky Chipperfield; Chipperfield Enterprises the Oxfordshire lion and tiger breeding centre owned by Dicky Chipperfield; and Mary Chipperfield Promotions, the huge training and animal dealing operation run by Mary Chipperfield in Hampshire.